Santa’s reindeer can have the best sense of humor. But, picking a funny reindeer Christmas card can be tough. Take a look these for some of the best in the humor class. Everyone you send one to will be able to laugh out loud or just plain chuckle. When we enjoy the holidays with some reindeer humor, we just can’t go wrong. Santa and his team of flying reindeer make a great image for the Christmas season. Young and old know most of the names of the reindeer and just about everyone has read the wonderful classic The Night Before Christmas to a child somewhere. So enjoying a little reindeer humor for the holidays wins hands down in my book. Inside is blank so you can what ever verse or text you like. 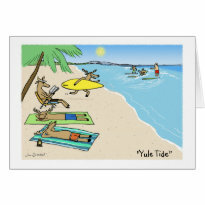 Reindeer at the beach are just one of those silly and funny things that gets us all chuckling. The humor is all around that unexpected. Reindeer are associated with the northern parts of the world and the cold, so humor is that they are playing in the surf during their off-season. Besides the fact that this is one of those unexpected funny visuals we add to that the play on words: Yule Tide. Result: one of my all-time favorites for funny reindeer cards. Inside verse is “warmest holiday wishes” which you can keep or change as you like. 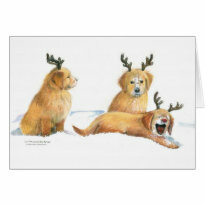 These charming little puppies all decked out as reindeer will bring a smile to any face. Don’t we all adore those little puppies? The inside verse is just as sweet for that wonderful ahhh factor. “Have a playful and fun Christmas with loved ones around you.” Being an animal lover myself, I just couldn’t resist including this adorable greeting card. It will put a smile on any Scrooge face and warm any cold heart. Inside verse: Have a playful and fun Christmas with loved ones around you. When you chose any one of these humorous greeting cards, you have the option to personalize it, change the inside verse, or just choose a blank inside notecard so you can write whatever you want. There is no minimum quantity you need to order, so you can pick several designed just for special friends and family. Ordering your funny reindeer Christmas cards through Zazzle is easy and can be fun when you start personalizing what you want on the cards. I do love to laugh and I very much enjoy receiving humorous Christmas cards. The reindeer pups are simply adorable too! 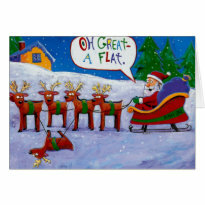 These reindeer cards are hysterical! I love them all! I need to start looking for mine soon. I always buy them from Zazzle! © 2016 Web Surfing Holidays and Parties. All rights reserved.